I hope you have been practicing your over easy and poached eggs. Working out the intricacies of those styles can be difficult but also rewarding. Just in case you're still working on the other two, the next egg styles – sunny side up and fried egg sandwich – are easier to do well and more difficult to mess up than their overeasy and poached brethren. So this should be a simpler lesson, but still useful for eggists at all levels. Oh, and check out the pictures too. Sunnies are probably most closely linked to that classic looking breakfast of bacon, eggs and toast. The classically runny yolks and crispy whites make for a good time mopping up your plate with the bacon and toast. But getting that perfect balance between crispy and soft yolk can be tricky, and sometimes just depends on your own eye and desired level of crispiness. For sunny side up eggs, you need a hot pan. I would recommend heating a pan at medium-high heat until a small drop of water sizzles. One way in which I differ from the classic sunny side up style is in using fat in the pan. I find it completely unnecessary to cook the eggs in butter or oil. I think a generous spray of nonfat cooking spray in the pan once it's hot is perfectly sufficient to keep the eggs from sticking without adding any fat. 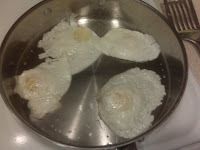 Once the pan is adequately hot and sprayed, you are ready to cook your eggs. 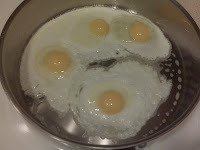 Crack each egg on a hard surface and drop it carefully over the pan so that the white doesn't splatter and the yolk is fairly centered in the white. It is easiest to do this if you hold the egg a few inches over the pan and just tip out the contents. Repeat this for each egg, making sure there is enough space in your pan for each egg to have its own space to cook. The whites can definitely touch, but if you're looking for crispy whites on each egg, then it's best to keep as much perimeter of each egg white free. You will notice that pretty quickly, the outer portions of the white will be already set. 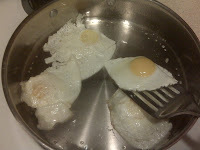 But there will still be a fairly thick layer of white encircling the yolk that does not cook immediately. This is normally the point where you would flip fried eggs to make them over easy, but with sunny side up you need to leave them alone until that part of the white has fully cooked. This may take another minute or so. Once this happens, the yolks will be cooked as well and have a soft, runny texture, which many associate closely with this egg style. However, many also want crispy whites with their runny yolks and this requires leaving the eggs for a little bit longer until desired crispiness is attained on the outside. Remove the eggs immediately when this happens though, as the longer you leave the eggs in, the harder the yolks will become. I would personally much rather preserve the soft yolk than get really crispy whites, so I remove the eggs after only another 20-30 seconds. At this point, slide your spatula under each egg carefully and place on a plate with toast and any other pairings you enjoy. 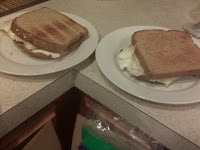 OR -- you can leave your eggs in the pan and follow a few more steps to make a classic fried egg sandwich. Now of course, you could put those soft-finished sunny side up eggs between two pieces of bread and it would be a tasty, albeit messy, fried egg sandwich, but the true fried egg sandwich involves really crisping up the whites and losing the super soft yolk by cooking each egg on its other side as well. SO, instead of removing each egg when it's done, flip it like a pancake with your spatula. This shouldn't be too difficult, as the egg is already cooked and there are no aesthetic pretenses, quite unlike the flip of the over easy egg. Once you flip it, cook it another minute or so, until it is as golden and crispy as you want. Then put two of your eggs between two spread slices of toast with a little bit of kosher salt and a cracking of pepper to bring out the great flavors of the egg. You have yourself a wonderful fried egg sandwich, a delicacy good at any time of the day. Plus, use whole wheat toast, don’t use butter and have some veggies on the side, and you have yourself a very healthy delicacy. What could be better than that?